If you’re a regular cyclist you’ll probably have noticed your leg muscles are bigger than before you were cycling! The primary muscles needed for cycling are the quads and hamstrings (front and back of the thighs), plus a bit from the calf muscles. The question is for Claire and André: do you think your thighs and calfs will be bigger or smaller by the end of your trip? So the main danger with long-distance cycling is these muscles getting over-developed, pulling the rest of the body out of alignment. This has a number of effects. If the oversized flexor muscles in the thigh start to pull the knee joint into inward rotation, this torques the leg bones, putting pressure on the knee, then the foot and the hips. If the hamstrings (back of the thigh) and psoas muscle get too tight, they can also pull the hips and leg out of alignment (see the figure). You can spot people with this issue when they start walking with their knees knocking and their bum sticking out too much! 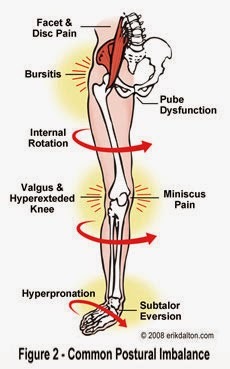 Another danger is iliotibial band friction syndrome, apparently one of the most common causes of knee pain in cyclists (runners, hikers, etc.). The iliotibial (IT) band is a very important line of fascia that runs from the outside of the pelvis, down the outside of the thigh, to just below the knee, and provides crucial stability for the knee joint. Pain and swelling in the knee area can happen if it starts to rub against a projection at the end of your femur as it moves forwards and back as the knee bends. So what can Claire and André do to help prevent all this happening on their long trip? I would suggest starting with 5mins in what’s called the “constructive rest position” – see image below. This helps the lower back and psoas muscle release and is very restful for the body. Then spend some time stretching the quads and hamstrings. A good one for the quads is to sit with your legs bent underneath you (sitting on your heels). Lean back on your hands, fingers facing forwards, then begin tucking your tail bone underneath (hips forwards) until you begin to feel the front of the thighs stretching. For the hamstrings, a simple forward fold with your knees bent and feet separated can work well, or try this one (see image below). Feet both face forwards, hold your elbows behind your back then fold forwards keeping that front knee slightly soft (i.e. not locking). Make sure to do both sides. Take some time in down dog to strengthen, stretch, and open the shoulders. Make sure to keep your knees bent (even if it’s just slightly). You can also vary it by treading back into your heels to stretch out the calves and achilles heels. A great one for opening into the thighs and giving that IT band some attention is what’s known as the “threading the needle” pose. Lying back, cross one ankle over the other knee then draw that knee up towards the chest. You can hold the thigh, just behind the knee, or the front of the knee on your shin. So called because you thread one arm through the gap between your legs! Do on both sides. One to finish would be revolved belly pose. This one helps to release tension in the spine, hips, shoulders, and – critically for cyclists – the pecs across the chest. Pulling up hills with the arms can strain the pecs more than you might think! Lying on your back with your arms out to either side and knees bent. Let your knees fall to one side, down to the floor, keeping your knees and ankles together. If the shoulder lifts, let it, then work on softening it towards the floor. You can add a twist in the neck by rolling the head in the opposite direction from your knees. Do both sides. Finally, I’d recommend doing all these exercises with as much awareness and presence as you can. Treat this time doing your yoga as time for yourself, time to relax, to connect with how you’re feeling, and an opportunity to breathe out any stresses from the day. 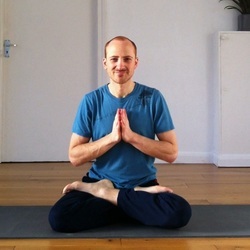 Mark Westmoquette is a trained zen yoga instructor in South London. Find him at..